The vast network of devices connected to the Internet, including tablets and smart phone and almost anything with a sensor on it – cars, machines in production plants, oil drills, jet engines, wearable devices, and more. These “things” collect and exchange data. 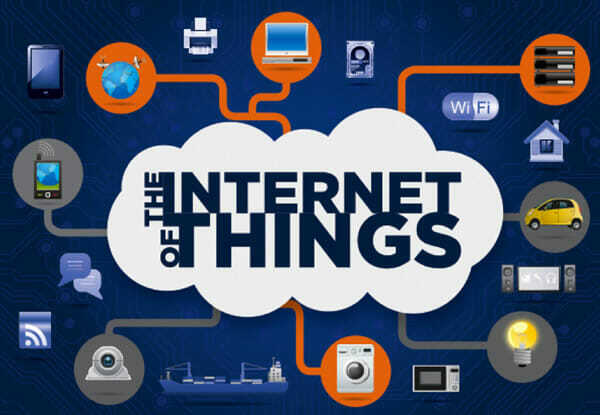 The Internet of Things is the network of physical objects or “things” embedded with sensors, electronics, software and network connectivity, which enables these objects to collect and exchange data. The Internet of Things allows objects to be controlled and sensed remotely across existing network infrastructure, creating opportunities for more direct integration between computer-based systems and the physical world, and resulting in improved efficiency, accuracy and economic benefit. 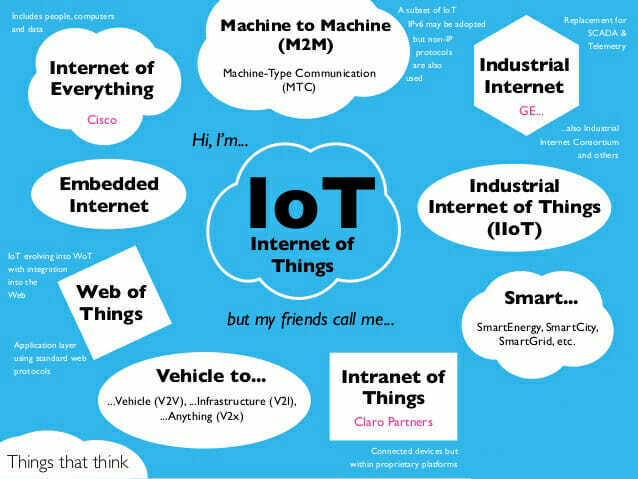 Things,” in the Internet of Things (IoT) sense, can refer to wide variety of devices such as biochip transponders on farm animals, electric clams in coastal waters, heart monitoring implants, automobiles with built-in sensors, DNA analysis devices for food/environmental/pathogen monitoring or field operation devices that assist fire-fighters in search and rescue operations. Internet of Things can connect devices embedded in various systems to the internet. The connectivity then helps us capture more data from more places, ensuring more ways of increasing efficiency and improving safety and IoT security. When objects/devices can represent themselves digitally, they can be controlled from anywhere. Internet of Things (IoT) is transformational forces that can help companies improve performance through IoT Security and IoT analytics to deliver better results. Businesses in the manufacturing, gas, oil, transportation, insurance, infrastructure and retail sectors can reap the benefits of IoT by making more informed decisions, aided by the torrent of interactional and transactional data at their disposal. The advantage of IoT is the ability to track individual consumers and targeting these consumers based on the information supplied by the devices. In a way, it provides a more “personalized” system that increase business sales and increases their demographic. Additionally, with the increased amount of devices connected to the Internet the Smart Grid expands, conserving more energy. Devices can make decision and adapt without human guidance to reduce their energy usage. 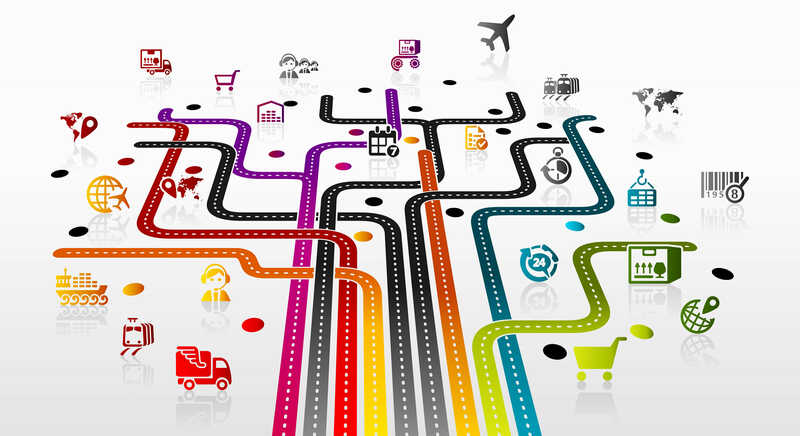 Internet of Things refers many benefits of businesses. IoT can be useful in many different categories including asset inventory and tracking control, location and shipping, individual tracking, security and energy conservation. 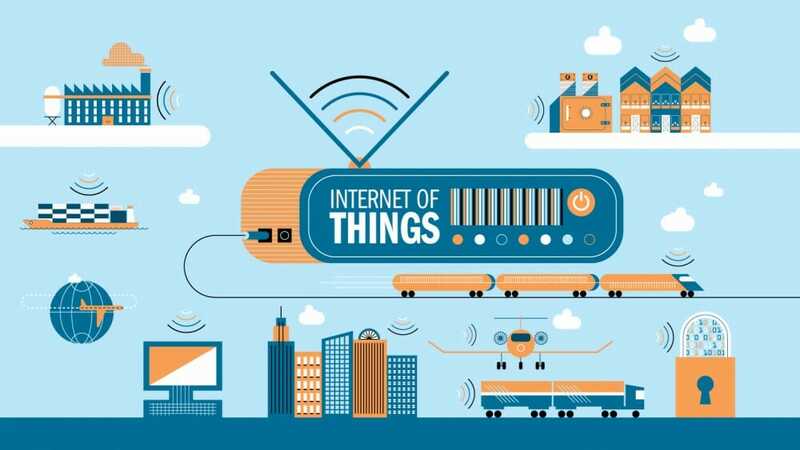 As mentioned before, IoT allows for the communication between devices, commonly referred to as Machine-to-Machine (M2M) communication. With this being possible, devices are able to communicate to people letting them know their condition and where it is located. Devices such as ships or trucks allow for the maximum capacity to be filled by communication amongst devices and then relaying that information to a person to capitalize on the data supplied. All of these combined maximize revenue by cutting cost of inefficiencies within the business. 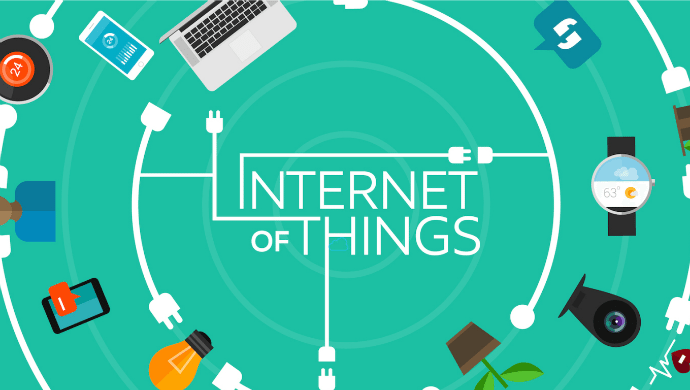 Conversations about the Internet of Things (IoT) are taking place all over the world. 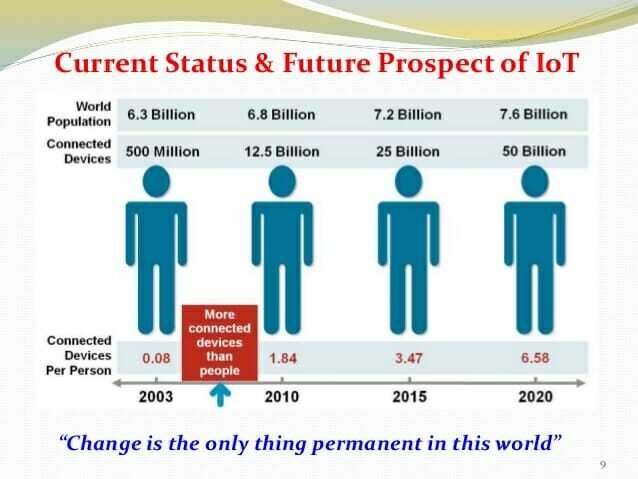 We are also trying to understand what the many opportunities and challenges are going to be as more and more devices start to join the IoT. For now the best thing that we can do is educate ourselves about what the IoT is and the potential impacts that can be seen on how we work and live. You can also discuss the IoT with us. Got questions? We’d love to hear them! We are now live in a Social Media-dominated world. Businesses and marketers are taking full advantage of it. Business needs to ensure they keep up with the latest social media trends to ensure they can achieve their target, whether that is to increase conversions or improve ROI.Social media the fastest growing industry of the present times is ever-changing in its form and nature. Social media services is all about user interface and what all the social media giants strive for is to perfect the user experience. What is the Benefits of Social Media in your Business? 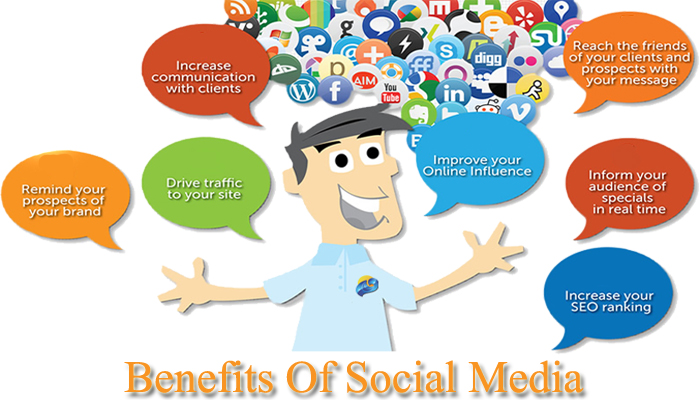 Benefits of social media are uncountable. When you have an available on social media, you make it easier for your customers to find and connecting with your customers on social, you’re more likely to increase customer and brand loyalty. 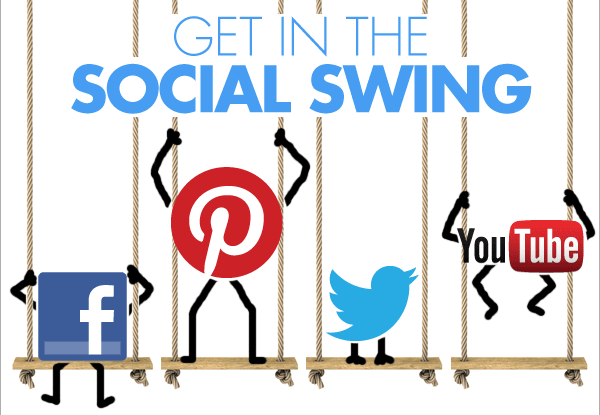 Social media services are the best platform way to promote your business and promote content. They offer powerful targeting options so that you can reach the right audience. If you run an ad campaign on social media, you can segment by things like location, company, job title, gender, and age etc. You can track and measure the performance of your social ads in real time. 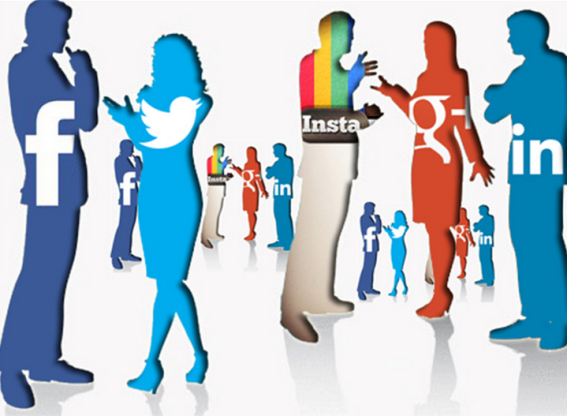 The Internet has 3 Billion users and over Billion of them have active social media accounts. Popular social media services platform have become marketing giants, offering businesses valuable data about their customers. Every day in social media there is over 4.5 Billion Likes on Facebook, 500 Million Tweets and 95 Million videos and photos uploaded to Instagram. Behind these staggering numbers is social information about your customers who they are, what they like, and how they feel about your brand. Social media generates a huge amount of data about your customers in real time. Through daily active engagement, you can gather relevant customer data and use that information to make smarter business decisions. Even if you aren’t available on social media, most of your customers expect you to be. Over 67 Percent of consumers now go to social media for social customer service. They expect the fast response and 24/7 support and companies that deliver win out. A study shows that companies engaging in social customer service see much bigger Annual Financial Gains. The popularity of social media services is they are continues growth, and 2016 was no exception. Facebook was the clear stand out social media platform and reached 1.79 Billion monthly active users of 2016 and YouTube, which has 1.3 Billion users. It is clear social media is here to stay, and businesses need to know what to do to capitalize on it and use the various platforms to their advantage. Paradigm Technocrats is the IT Solution and Digital MarketingCompany. We provide all stage of digital marketing, with a focus on web and mobile application development. Our offerings cover all stages of the digital marketing: SEO, SEM, SMM, Software Development, Content Writing and Virtual Assistant support. In simple words, we are a one stop shop for all your IT needs. We recognize that each client is different. Our highly skilled team of in-house IT professionals takes the time to understand your business and propose the most effective and strategic way forward. We deliver the best possible results for your business -On Time and Within Budget. 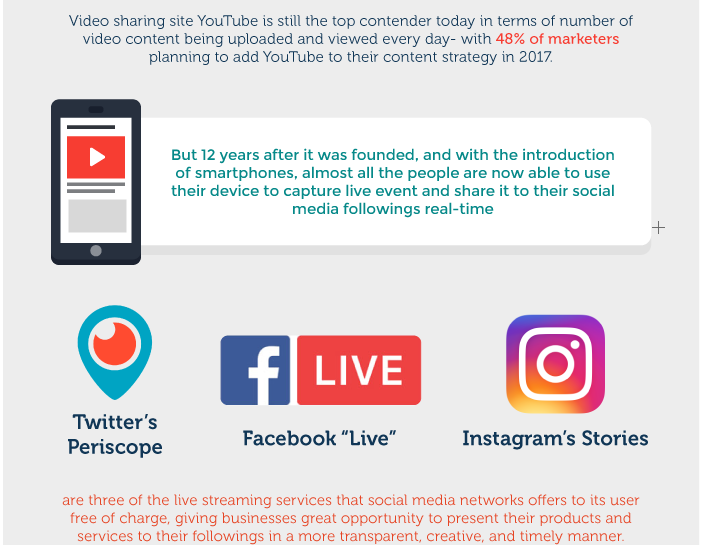 Live video trend that took off in 2016, but it has so much more potential that it has yet to reach. There are already social media platforms taking advantage of this – YouTube Live, Facebook Live and Periscope Pro, to name a few, with Instagram recently releasing the live video to US residents. Facebook has announced that it will roll out its 360-Degree video for Facebook Live users for all Facebook profiles and Pages in 2017. YouTube has already announced the same feature. Live video will be a great feature for businesses to capitalize on. it can even be streamed to event listing and groups. It’s a great way to raise awareness of your brand and build a community. Artificial Intelligence is new advancing technology and is set to be a game-changer for 2017. So much so, that investment in Artificial Intelligence is expected to triple in 2017. Some of the biggest tech companies, such as Google, Microsoft, and Facebook, have been releasing their Artificial Intelligencetechnology to be used by the public. 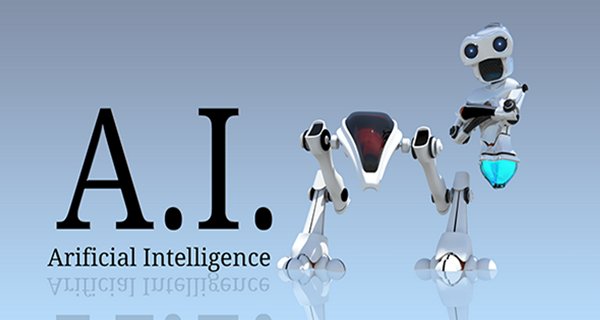 Artificial intelligence is already used by large applications, either to improve search engines, such as – Google’s case, or in Wikipedia’s case to identify inaccurate or damaged articles. The need for people to speak directly to faceless machines is set to redefine businesses social media technique and how they communicate with their customers. Chatbots are able to answer customer’s queries, and businesses will be able to use this to ensure they have a sales associate ready to talk to customers 24/7. 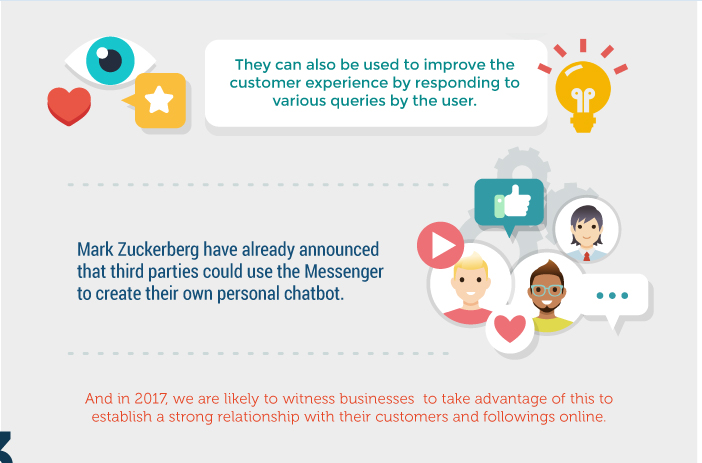 Mark Zuckerberg announced use Chatbots to create their personal Chatbot platform. Big companies including Google and IBM have also jumped on board in order to make their services seem more relevant to users. This can help not only communicate with their customers, but nurture business to business leads and increase sales and conversions. People want their customer experience enhanced, and introducing is the perfect solution. Social media has 2.3 Billion active users and more than 1.9 Billionactive mobile social users worldwide. This large amount of potential customers has prompted 83% of all marketers to take advantage of social media marketing in order to boost promote brand identity, sales, increase social media followers, engage with generate qualified leads, prospective customers and so on. 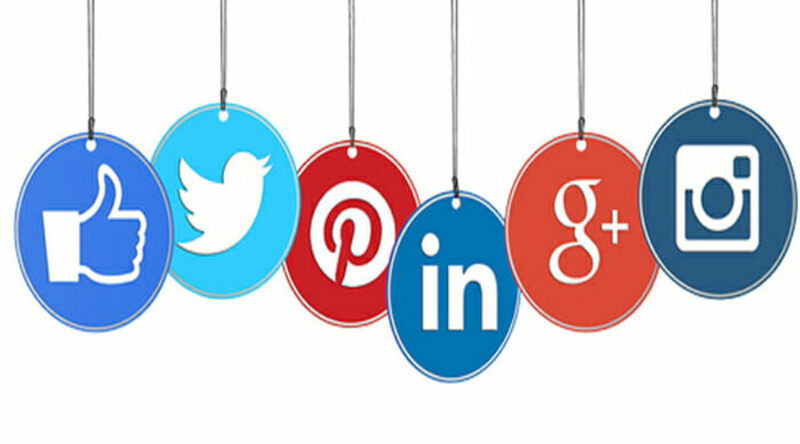 Social media services help your business connect with and learn from your potential consumers and the industry leaders. Simple activities such as liking or replying to responding to private messages, comments, retweeting, or even commenting when it matters can lead to relationship building, which is essential for your business as it can help retain consumers and form connections with the industry leaders that can help you. With these advantages, there’s no doubt that social media is an indispensable part of today’s digital marketing landscape. 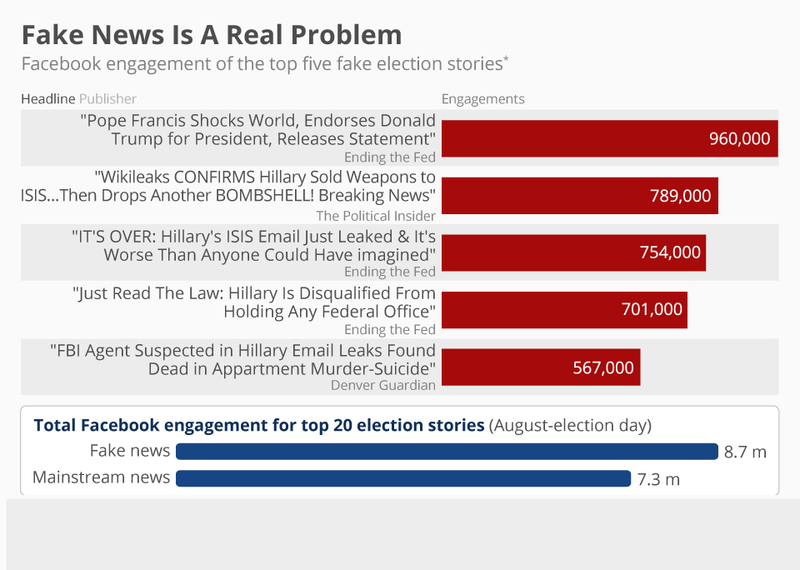 Fake news was a huge problem for social media platform in 2016 and was highlighted during the US Presidential Election. While Facebook announced in November that it has banned Fake News Sites from using Ads, there is still much progress to make. Google’s struggle to tackle fake news to see the difficulties social media platforms will have. While Google changed its algorithm, it has actually made the search engine more vulnerable to fake news. Fake news is able to gain a high volume of traffic, and therefore increase its ranking on the search engine’s results page. Google says that fake news isn’t going anywhere anytime soon. In 2017, it can be expected that the big social media platforms will make changes to ensure fake news doesn’t continue to spread. 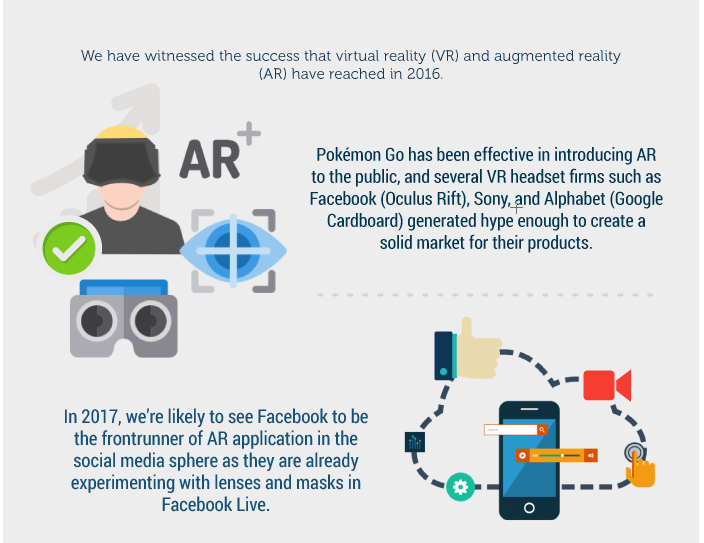 Virtual reality and Augmented Reality is still new concept to the marketing scene, and in 2017, we predict the market will get even more popular. What’s unique about virtual reality is that it encourages engagement by offering a memorable, immersive experience unlike any other medium and brands are quickly recognizing that value. Around 75% of millennials are interested in virtual reality, and 2017 may just be the year they blow up the idea of self insertion into media. Same as Snapchat selfie lenses brought the idea of augmented reality into the social platform. Pokemon Go (arguably a social media app) turned it into a sensation in 2016. Mark Zuckerberg has confirmed that Facebook is experimenting with augmented reality. They recently acquired Masquerade, a live filter and selfie app for live streaming video. Augmented reality is actually an old technology that’s started to go viral thanks to social media. Just like live video, augmented reality create new opportunities for brands to connect with their audience by sharing experiences, rather than just information, on social media. Online is old news. Online in social media is today’s news. Social media services are not a media. This is the key to listen, engage, and build relationship. A social media platform to helps promote yourself to a wider audience. Social media services are not a subset of the internet. Social media is the internet. We don’t have choice on whether we do social media the question is how well we do it.